Can Big Data lead to Smarter Farming? The 21st century has seen a rapid increase in the amount of data being collected throughout the agricultural supply chain i.e. from field to fork. For example, farmers use sensors for soil sampling and mobile apps, cameras and drones to monitor pests and diseases, generating huge amounts of data. Recent technological developments in sensors and remote monitoring have increased the volume, variety, velocity and veracity of agricultural data…but how can farmers, agribusinesses and researchers gain real value from all this “big data”? Smart sensors and devices produce vast amounts of data that should provide unprecedented decision-making capabilities. Big Data is expected to have a large impact on Smart Farming and the Internet of AgriThings throughout the whole supply chain. Big Data is expected to cause major shifts in roles and power relations among traditional and non-traditional players. Governance (incl. data ownership, privacy, security) and business models are key issues to be addressed in future research. The UK agricultural industry should harness the power of data to support decision-making and ensure future success. There are now hundreds of companies offering everything from farm management software and precision tools to bots and drones, all using the power of big data. However, data experts say 90 per cent of the data collected is wasted. 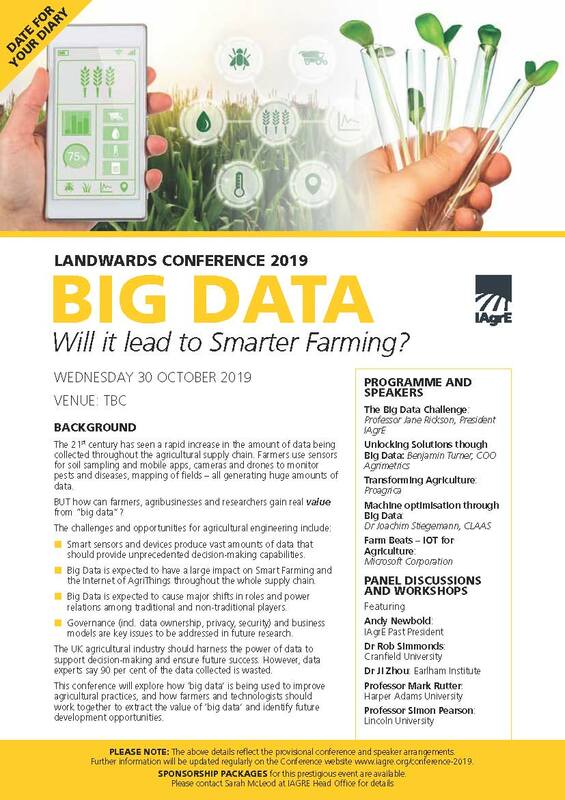 This conference will explore how ‘big data’ is being used to improve agricultural practices, how farmers and technologists should work together to extract the value of ‘big data’ and identify future development opportunities. The first draft of the programme is available here and we have had the first few speakers confirmed so watch this space. The venue is yet to be confirmed.